All My Books is close to becoming the perfect librarian. Organizing your bookshelves into a convenient library that is easy to browse and to search, All My Books is a library and the librarian in one tool. Group and browse your collection of books by title, author or publisher, or run a quick search by any field. You can even define your own fields to label the books, such as comments or memos, and search them later. 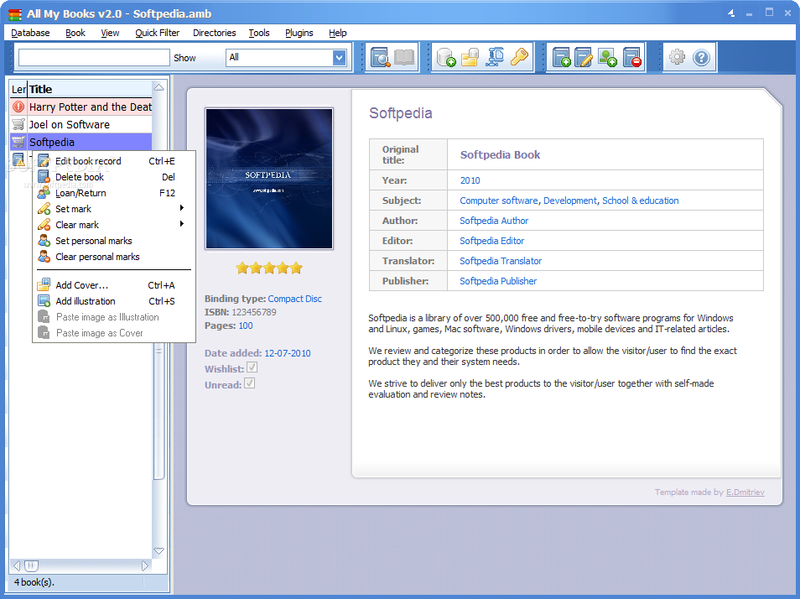 ...... You can even define your own fields to label the books, such as comments or memos, and search them later. What use would be an electronic book organizer if you had to spend hours to catalogue your entire collection? All My Books does not ask you about every little detail about the book. Instead, it implements a revolutionary way to create and organize your collection. No longer must you type information about every book by hand! Just enter the book's title or ISBN number from the back of the book, and All My Books will retrieve the rest of the data automatically from the Internet. Missing a book? You might have loaned it out a while ago, but can you remember who borrowed the book from you and when? All My Books tracks the books from your collection with the built-in loaner manager. Real world application that shows how to use MySQL with PHP. �Balls�- is the logical computer game, created as office-game. IE Plugin scans face, finger or voice Biometrics for secure logon to Web Sites. Qweas is providing links to All My Books 3.1 as a courtesy, and makes no representations regarding All My Books or any other applications or any information related thereto. Any questions, complaints or claims regarding this application All My Books 3.1 must be directed to the appropriate software vendor. You may click the publisher link of All My Books on the top of this page to get more details about the vendor.